Please note that I am printing these updates to Duck Camp 2008 in reverse order. Over the next week (Nov. 19th - Day 2 and Nov. 21th - Day 1) I will finish the write-ups on the final two days of this exciting/excruciating three days of hunting. Picture above is the view out of the front window at duck camp. Gigantic rumbles of thunder sounded in the distance signaling that duck camp 2008 was not to pass quietly into history. The approaching torrential rains sounded like the rumble of a taxiing C130 and hit our small cabin with such force that small rivulets of rain began crawling through the shingles and creating murky puddles. Bolts of lightning soon arrived and began dancing around Duckman’s 20 foot Lund. Bobbing on the angry Atlantic Ocean the craft was swung violently back and forth on a lobster boat mooring. As the boat’s whining automatic bilge pump struggled against the rising storm Duckman frantically paced in front of the cabins small windows peering with wild eyes out into the building hurricane. 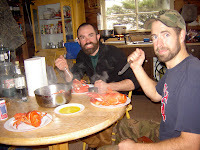 Pondering our situation, we wondered if we might be spending another night resting peacefully in the small cabin nestled comfortably on a small island off the Maine coast. I silently hoped that duck camp would be extended and extra day. Unfortunately, like many late season storms this one departed as quickly as it had arrived and within a few hours the sun was attempting to peak out from behind the threatening skies. With our bellies crammed full of eggs, bacon and several pounds of moose breakfast sausage we began the complex task of packing up camp while Duckman launched the row boat and oared out to check on possible damage. I am happy to report that Duckman’s new boat is a champion and it shrugged off the gnarly unforeseen storm easier than Duckman’s wife fighting off his advances on date night. As we motored back to the boat landing Duckman navigated our course through lobster buoys, rock weed and hidden ledges with expert precision. Decades of navigation through these waters having left their mark on him as a master seaman. As the motor droned on in the distant reaches of my mind, I silently reflected on the previous 2 days of duck camp 2008. I can see why you were hoping for another ay at camp - that's quite a view! Yeah, hats off to Duckman who set us up at Duck Camp this year! What an amazing spot! thats a beautiful picture on the top of this page. did you have romantic plans that evening. DEDH is nice.